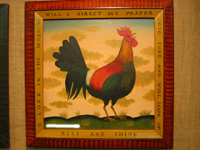 Diane Ulmer Pedersen has been painting in a folk art style for over half her life. She can't remember life before art. having taken her first lessons at the Philadelphia Art Museum before entering grade school. She went on to earn her BFA from Denison University. 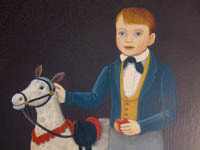 While working in an antique and decorating shop, she began painting naive portraits of children (real and imaginary). In researching these portraits, she encountered other folk art forms: landscapes, still lifes, theorem paintings, stenciling and faux graining, needlework, sculpture, scherenschnitte, and so on. She became fascinated with the stylizations, the colors, the textures, and the crackled and aged finishes. The feeling of peace, light-heartedness, and friendly openness they generated found a resonance inside her. 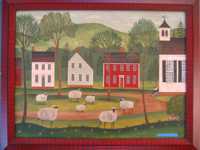 Pedersen gradually developed a personal style by incorporating subjects, forms, and techniques from 18th and 19th century folk art in her work. 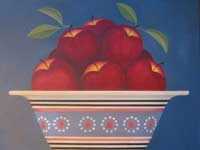 She applied this style not only to her portraits, but also landscapes and still lifes. 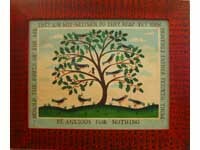 Many pieces are additionally inspired by short verses from the Bible. Pedersen's paintings are original compositions on gessoed fiberboard, plastic laminate, wood, canvas, or paper. She paints in acrylics in two basic styles: one resembling watercolors and the other, oils. The "oil" paintings incorporate layers of color and have a crackled finish achieved through a series of glazes applied over the artwork. 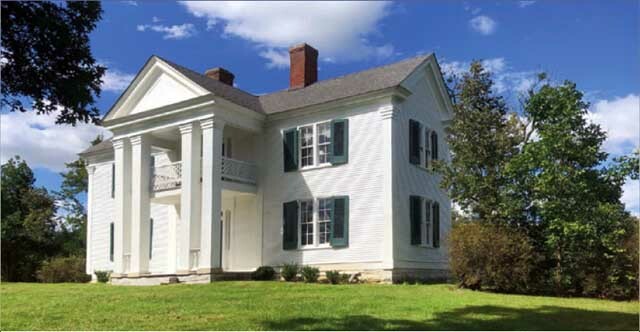 Since the early 1970s, Pedersen has exhibited at juried arts festivals and folk art shows in the Northeast. She also has displayed in galleries, designer showcases, schools and churches and has sold work to specialty shops around the country. Pedesen and her husband moved from the Philadelphia area to Massachusetts in 1987 and adopted a son, Christopher, in 1996. 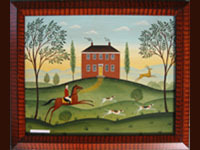 Since then Pedersen has traveled less and has concentrated more on painting and designing for publication and for the licensing of her work, which now can be found on wallpaper borders, greeting cards, calendars, gift bags, collector plates, framed prints, furniture accessory pieces, woven throws, wallhangings, pillows, placemats, coasters, trivets. custom wood puzzles, and floormats.